1. Asphalt repair and patching Work includes removal and replacement, surface patching, pothole and chuckhole filling; also Infrared repair. 2. Joint and crack filling Unfilled cracks and joints are one of the major sources of pavement failure. Freeze-thaw cycles enlarge cracks allowing water erosion of the base material. The answer: Hot rubberized joint and crackfill installation work. 3. 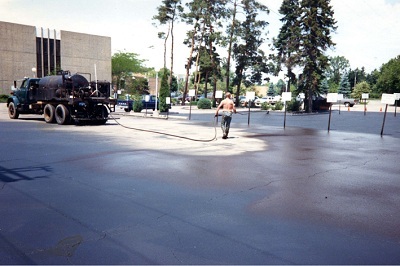 Sealcoating A protective coating that will preserve, protect and beautify your asphalt pavements; sealcoating maintenance can easily double the life of asphalt pavements while dramatically reducing annual maintenance costs. 4. Infrared asphalt repair No saw cutting or jack hammering required. No costly removal and replacement needed. 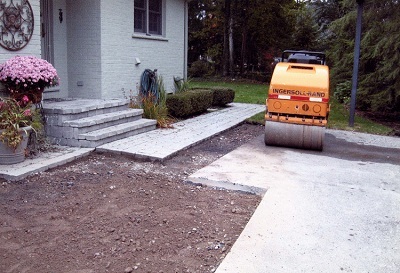 Existing asphalt is heated and blended with new hot mix asphalt and rolled. Rapid turnaround. Little noise. 5. Drain adjustments and repairs Reset drain frame and cover elevation to correct surface water problems. Structural repairs, brick and block replacement etc.. All types of repair and replacement work. 6. Asphalt curb replacement Removal and replacement of damaged asphalt curbing to match existing curbing. 8. Parking lot sweeping and cleanup Complete parking lot cleanup and sweeping that includes debris removal and related work.